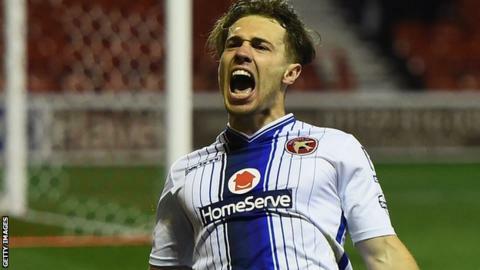 Walsall remained second behind Burton in League One despite being held at home by struggling Crewe Alexandra. Walsall are now three points off top spot ahead of Tuesday night's trip to Scunthorpe, while Crewe, who host Southend, remain second from bottom. "To follow the performance on Wednesday night against Chelsea with the sort of quality we showed is really pleasing, because it could have been a case of 'After the Lord Mayor's Show'. "I've got a lot of respect for Crewe with their philosophy and the way they play. But to outperform them like we did was excellent. It was one-way traffic. "We could have been out of sight at a canter at one stage. It felt like there was a force-field around their goal at times. But you're always open to a counter attack." "I was disappointed with how we started but we were much better second half when we started to play. We showed our intent taking a midfielder off and putting a forward on. We thought we could nick it. "When a team is flying like Walsall are it's very difficult to get anything and we went toe-to-toe with them, had a real go and we got our rewards. "Conceding the manner of goal we did was disappointing but we battled back with a great strike from arguably our best player, Ben Nugent. He was terrific at the back, immense with clearance, blocks and headers." Match ends, Walsall 1, Crewe Alexandra 1. Second Half ends, Walsall 1, Crewe Alexandra 1. Attempt missed. Tom Bradshaw (Walsall) left footed shot from the centre of the box is just a bit too high. Corner, Walsall. Conceded by David Fox. Harry Wilson (Crewe Alexandra) wins a free kick in the defensive half. Attempt saved. Kieron Morris (Walsall) left footed shot from outside the box is saved in the top centre of the goal. Romaine Sawyers (Walsall) is shown the yellow card for a bad foul. Ryan Colclough (Crewe Alexandra) wins a free kick in the attacking half. Attempt saved. Harry Wilson (Crewe Alexandra) right footed shot from outside the box is saved in the centre of the goal. Foul by Harry Wilson (Crewe Alexandra). Attempt missed. Kieron Morris (Walsall) left footed shot from the centre of the box is close, but misses to the right. Attempt saved. Kieron Morris (Walsall) right footed shot from outside the box is saved in the bottom right corner. Corner, Crewe Alexandra. Conceded by Jason Demetriou. Attempt saved. Jordan Cook (Walsall) right footed shot from the right side of the box is saved in the bottom right corner. Substitution, Crewe Alexandra. Marcus Haber replaces Chris Atkinson. Jason Demetriou (Walsall) hits the bar with a right footed shot from outside the box. Substitution, Crewe Alexandra. Harry Wilson replaces Lauri Dalla Valle. Attempt missed. Andy Taylor (Walsall) right footed shot from outside the box is too high from a direct free kick. Substitution, Walsall. Jordan Cook replaces Anthony Forde. Attempt saved. Anthony Forde (Walsall) right footed shot from the centre of the box is saved in the centre of the goal. Attempt missed. Adam Chambers (Walsall) header from very close range is close, but misses to the left. David Fox (Crewe Alexandra) is shown the yellow card for a bad foul. Foul by David Fox (Crewe Alexandra). Corner, Walsall. Conceded by Stephen Kingsley. Lauri Dalla Valle (Crewe Alexandra) wins a free kick in the attacking half.